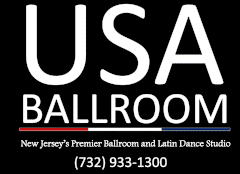 USA Ballroom is a Red Bank, NJ based latin and ballroom dance studio. We are dedicated to the art of dance and are committed to helping our students realize their goals. We enjoy the relationships that are built here as well as watching our students reap the benefits of learning how to dance. By enrolling in lessons at USA Ballroom you will become more confident, learn how to move with the music, and how to take command of the dance floor, all while having a lot of fun! Our dance studio offers instruction on all types of dance. We will teach you how to find the beat, how to move along with the rhythm, and how to communicate with your partner. We offer dance instruction in Salsa, Latin, Tango, Rumba, Foxtrot, Cha Cha, and many other dance styles. Whether you want to learn the Samba or have dreamed about taking control with the Bolero, trust us to teach you the moves and help you move gracefully. We even offer lessons in the Waltz, Hustle, and Swing; so you can dance along no matter what the band is playing. Get off the wall and out onto the dance floor at your next social event. Whether you are a bride and groom preparing for the wedding, or a teenager who wants to impress his date at the big dance, we can help you learn how to move with the music! Call us today at (732) 933-1300 to learn more about our group dance classes, private lessons, and Friday night socials. USA Ballroom employs extremely friendly, fun-loving, award winning (national & local) dance instructors. USA Ballroom isn’t just a “dance studio”. It’s a place to experiencing new things and people in a healthy, positive environment. Whether you want to try something new, get a great workout, or have fun in a group setting, USA Ballroom is the place to do it. Our community is a tight-knit family and we accept people of all skillsets, from beginners to national competitors. My fiancee and I took an introductory class here on a whim and loved it. We immediately bought a package of classes. The teachers are fantastic. JayJay has taught us so much in such a short amount of time and is always vibrant and fun. Each week, we looked forward to coming, getting a workout, and learning some new moves. It’s been a wonderful experience and I urge anyone unsure to take the plunge.